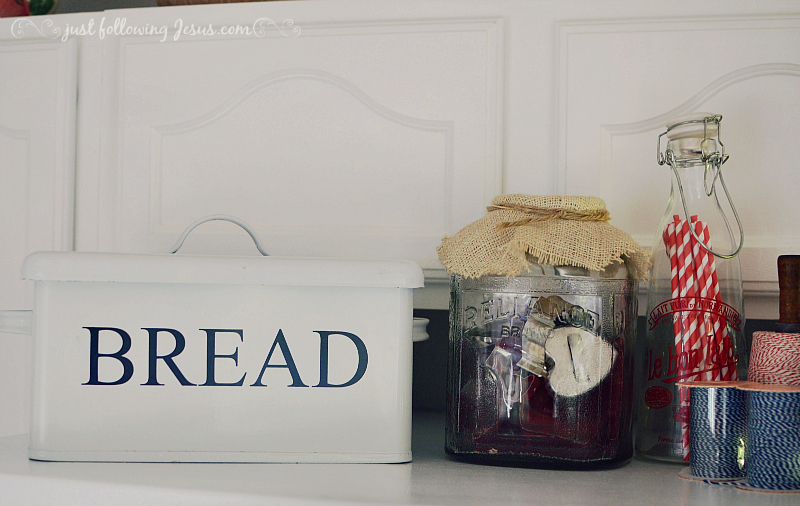 Just following Jesus in my real life...: Friday Faves...a Goodwill enamelware bread box! 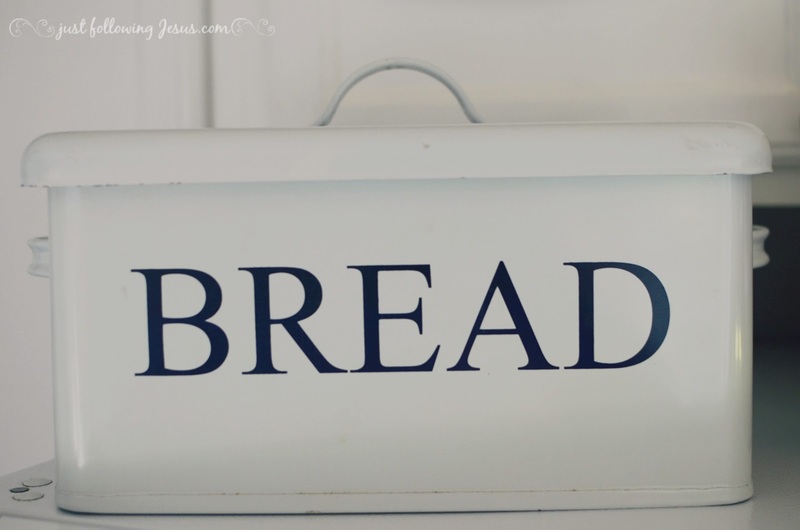 Friday Faves...a Goodwill enamelware bread box! I've wanted an enamelware bread box for so long! I've pinned them on Pinterest. I've searched for them online. I've looked for antique bread boxes in antique stores and malls all over kingdom come. I've looked at reproduction bread boxes as well. But, I could never seem to actually buy one for several reasons. I would keep a basket of bread in our microwave. My family always grumbled about having to deal with the basket of bread before they could use the microwave. sitting out on the counter or on top of the refrigerator. Since space was the issue, some enamelware bread boxes that I found were simply too big. Then there was the price. Antique enamelware bread boxes ranged from the $50 dollar range, for the least expensive one I found, to the $200 range. While I love antiques, I just couldn't bring myself to pay that kind of money. Reproductions were usually $40 and up. Was I ever excited to find this enamelware bread box at the Goodwill for $9.99! It's the perfect size, too! but it looks great and is just what I needed to solve the bread in the microwave issue. 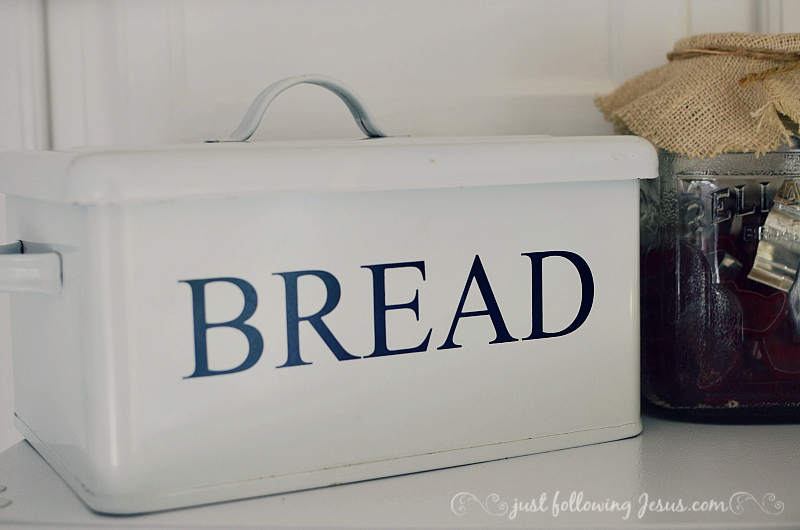 Now our loaf of bread can sit on top of the refrigerator in my cute bread box. mentioned how much he likes it a couple of different times! 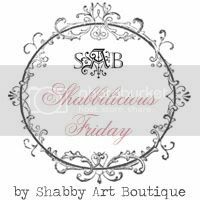 I love Fridays, since it's my husband's day off! What a steal! I love your 'new' bread box. 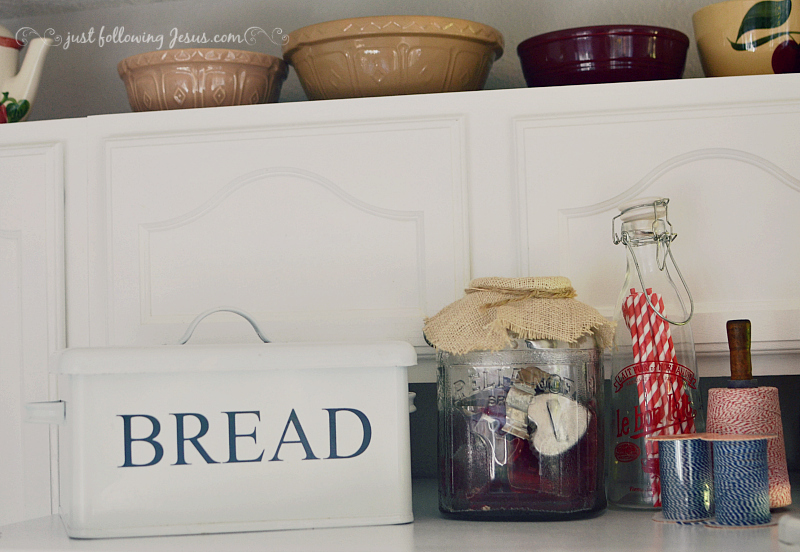 My mother had a vintage bread box on the kitchen counter when I was growing up. I had it for quite a few years after I got married but it had seen better days - and I was too 'cool' to let anyone see it. So I got rid of it! Now I wish I had one. I'm happy you found one that is perfect for your kitchen. I once got rid of a whole solid wood antique bedroom set given to us by missionaries, in order to update to a more modern pressboard set. Oh the foolishness! I so agree! He's way better to me than I deserve! Isn't it great when you find one of your treasures? I think it's so pretty. Yippee-what a great find! I love how when you spent a long time looking for something, you stumble upon it unexpectedly. Thanks for sharing at Fridays Unfolded! I love to stumble onto something I've been looking for for a long time, too! I feel blessed! Looks like it is right at home there. I came upon a tall vintage white one with red handles somewhere along the way ... it's holding center court in my fireplace, brimming over with dried eucalyptis. Oh, I want to see a photo! Have a happy date day! (I think you two date on his day off, don't you?) I love the bread box and think is just perfect. It has the look of vintage without the vintage price. It would love perfect in my kitchen, too. Love your new breadbox. Most of the old ones don't have lids so the reproductions are more functional. I saw a vintage one for $85 yesterday and I have been fighting myself not to go down and buy it. I don't need it, but that's not why we buy things now is it?